﻿Bruce Goodman's "No chest pain"
Libby had just picked her husband, Jonathan, up from the hospital. He’d been there for “more than a few days” for a rather serious operation. It’s amazing what medical science can do these days. The surgeon (he was from the Middle East; hospitals are such cosmopolitan places!) had replaced one of Jonathan’s heart valves with a pig’s valve. They can do it! They did it! Jonathan was feeling a box of birds! The thing he most looked forward to was a decent meal. Not that there was anything wrong with the hospital food. It was quite alright. But Libby’s home cooking was much nicer. It was so carefully prepared, so tasty. And of course, being at home, the meal could be eaten leisurely in familiar surroundings without everyone looking. How tired he was of eating from a tray! 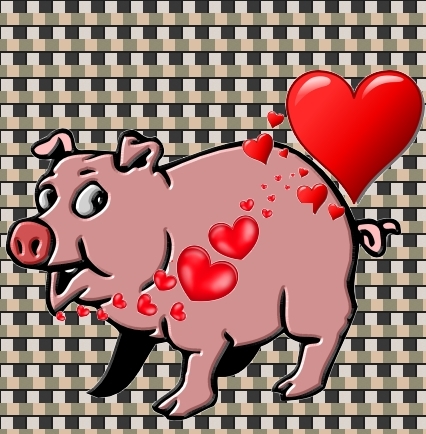 And how wonderful it will be, with his brand new pig’s valve, to eat without chest pain! “So what’s for dinner?” asked Jonathan. “Roast pork,” said Libby. "The surgeon gave it to me. He said there was quite a lot of pork left over."